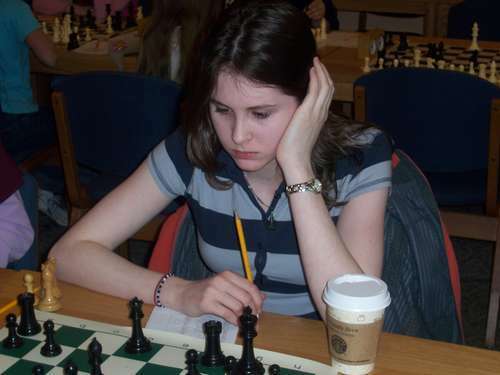 03.04.07 In a dramatic finish that inspired applause from the onlookers, Lily Briggs, a 12th grade homeschooler from Lubec, Maine, defeated defending Girls Champion Margaret Bryan to become the 2007 Maine Girls Scholastic Chess Champion. 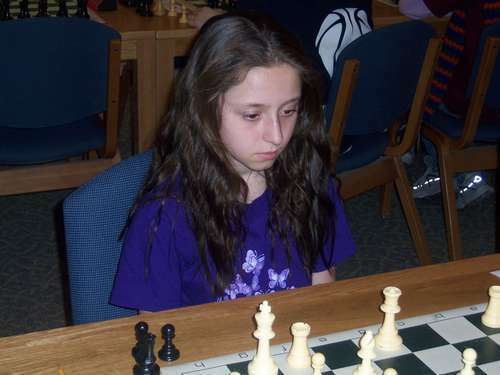 Lily's perfect score of four wins without a loss or a draw, earned her the right to represent the State of Maine at the Susan Polgar National Invitational Chess Championship for Girls during the United States Chess Championship held later this year in Cherry Hill, New Jersey. Here's the illustrated tournament report with crosstables and the championship game annotated by Fritz 9. 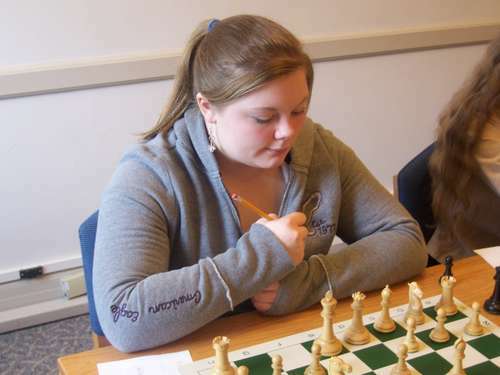 With wins over Miriam Nielsen, Sorel Edes, Lisa Tapley and a facinating struggle in round four with Margaret Bryan that ended when the defending champion turned her King over on move 49, Lily Briggs has become Maine Girls Scholastic Champion. 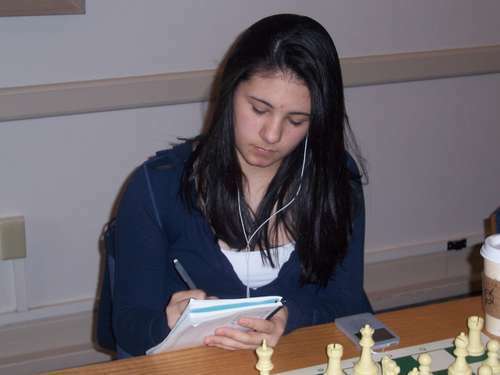 Goldie Garcia, a 9th grader from Deer Isle - Stonington finished in second with 3.5 points. 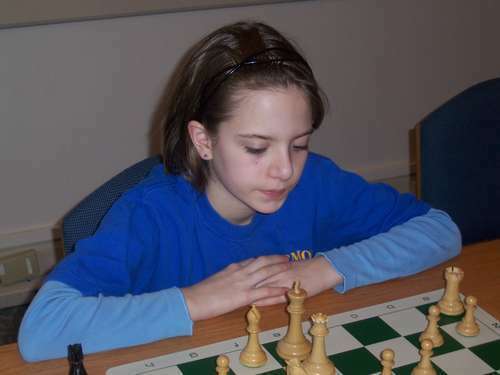 Starting with a draw in Round 1, Goldie proceeded to win her next three games. 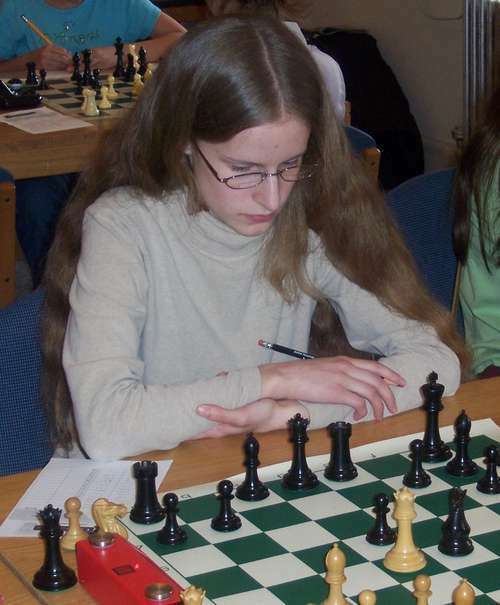 The final standings were out of her hands at that point as the result of Board 1 was yet to be decided. 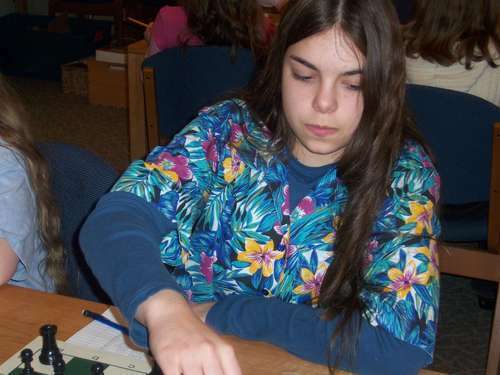 Goldie was persued by a group locked in a four-way tie for third including: Margaret Bryan, Miriam Nelson, Haley DeLuca Lowell and Gillian Anderson. 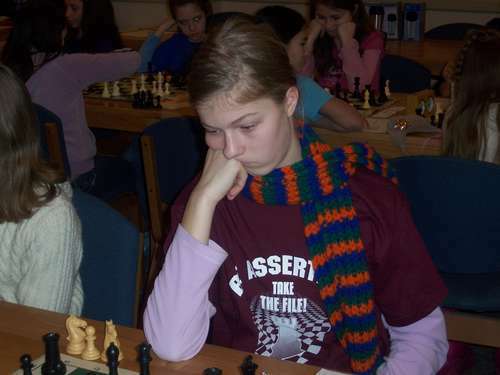 In addition to tieing for third overall, Miriam took the grade 9-12 trophy and Haley received the grade 3-5 trophy. 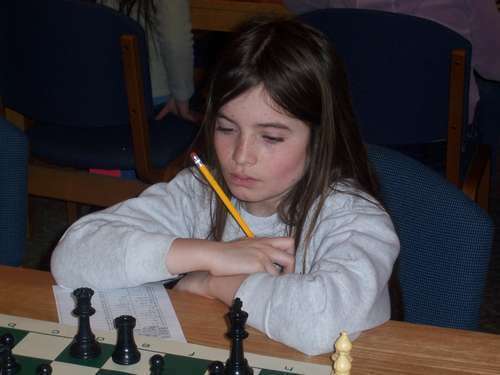 Also winning their divisions were Lisa Tapley (grade 6-8) and Mia Massey (grade K-2). Each particpant in this tournament received an engraved medallion. 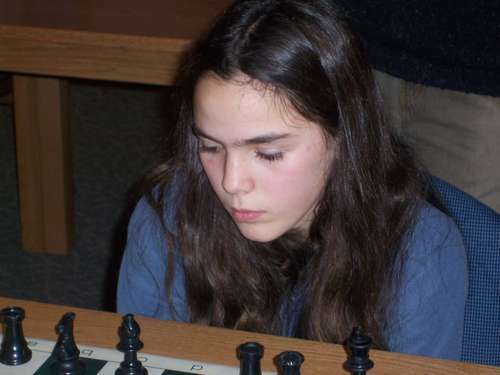 This second annual girls championship held at the University of Maine, Orono on Saturday, March 3, 2007 was a four round swiss that attracted twenty-seven competitors and was played at a time control of Game in 60 minutes. 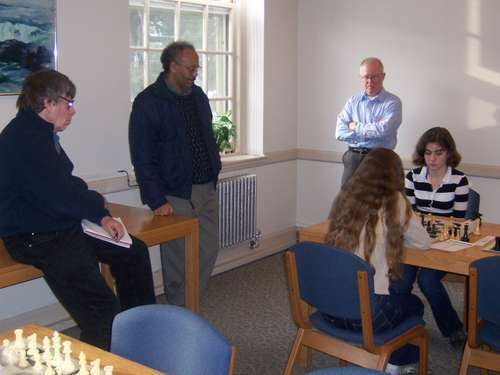 The tournament was organized and directed by Dan DeLuca with assistance from Assistant Tournament Director Andy Bryan, Ron Lewis, Fred Irons and Kathy Richards. Thanks to the University of Maine, Orono for hosting this event and thanks to all who made it a great sucess. Click here to replay this game. It was not to be this year for defending champion Maggie Bryan. Yippee! 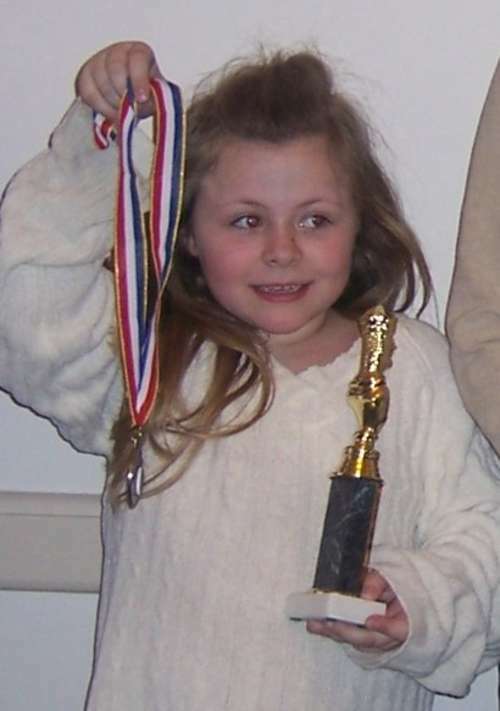 Lily, there's no stopping you. Next, Cherry Hill, and then...? !